In 1810 a young man from Vermont, Elijah Fletcher, left home to seek a position as a tutor in a far distant southern state. After an arduous journey of many months on a bay mare, he arrived in New Glasgow, Virginia in May 1811. He had accepted the presidency of the New Glasgow Academy (a private school for boys). He settled into the neighborhood quickly and soon met one of the leading families: the Crawfords (who lived at Tusculum). In April 1813 he married Maria Antoinette, daughter of William Sidney Crawford. They began their married life in Lynchburg, Eiljah soon left teaching and turned to land sales, politics, and eventually farming. In the 1840s Elijah tired of town life and decided to retire to one his favorite plantations, named Sweet Briar after a species of rose favored by his wife. They had four living children: Sidney (1821-1898), Lucian (1824-1895), Indiana (1828-1900), and Elizabeth (1831-1890). When Elijah died in 1858 he deeded Sweet Briar to his eldest daughter, Indiana. Sidney had already inherited Tusculum, his mother's family's plantation and Elizabeth built a plantation across the road from Sweet Briar which she named Mt San Angelo. The fourth son, Lucian, did not inherit any land from his father. 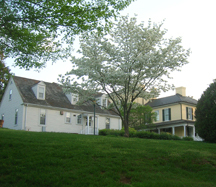 The Sweet Briar Plantation House and a mid-19th Century cottage.